What better way to grab some fresh sea air than to have it force-fed through the visor of a crash helmet! 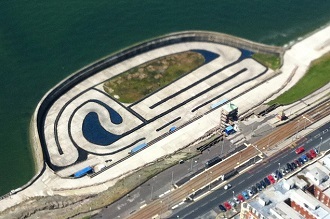 The splendid Formula Kart circuit at Blackpool is not only a terrific track but it’s also one of the few outdoor go-kart circuits in the North West so it’s worth the trip. Favoured by stag and hen groups due to its close proximity to the popular party resort, this go kart track provides the ideal activity to let off some steam before hitting the bars and clubs, or simply to enjoy as part of a day out at the beach. Twin-engine karts capable of 60mph are used on the concrete-surfaced autodrome and the fact that it’s 10 metres wide in some places means that there is plenty of scope for overtaking – something that is sadly lacking in Formula 1. There are a full range of events for both adults and juniors as young as 8 years and you will be well looked after by the very friendly team at Blackpool. At J4 on the M55 take the third exit A583/Preston New Road. Continue to follow A583 for two miles then turn right at A583/Whitegate Drive. Whitegate Drive then becomes Devonshire Square (continue straight ahead) then continue on Devonshire Rd B5124 for 1.2 miles. At Warbreck Hill Rd (left lane downhill at traffic lights), take the first exit onto B5265/Warbreck Hill Rd Go through 1 roundabout, at the roundabout, take the third exit onto A584/Queen's Promenade. A team endurance event. Qualifying to determine your grid position then a non-stop relay event for teams of 2 to 4 drivers sharing a kart.